When we think of the beach, our minds immediately think about coastal locations looking out onto seas and oceans like the Atlantic or Pacific, but it’s interesting to remember that beaches don’t always have to be found on the edges of a country. Many beaches can be found in inland locations as well, by the sides of rivers, lakes, or reservoirs. If you happen to be living or visiting an inland area and wish to visit the beach, there’s no need to despair and there’s no need to jump in the car and drive for hours on end to get to the coast; lots of lovely beaches can be found in surprising places where you least expect them. There are some great examples of inland beaches in many states, including Texas. Texas, of course, has a long stretch of coastline looking out onto the Gulf of Mexico, with lots of nice beaches near cities like Houston, Galveston, and Corpus Christi. Despite being located in an inland position rather than on the coast, the state capital of Texas, Austin, is actually home to a long list of nice riverside and lakefront beaches. So, no matter where you happen to be in Austin, you’re always only a short distance away from at least a few great beaches, perfect for all kinds of fun activities. Looking for the best beaches in Austin? If so, you're in the right place. Texas' capital city is home to a surprisingly long list of super lake and river beaches, with soft sands and warm waters that offer the perfect conditions for all of the classic fun in the sun activities you’d enjoy at any other beach like swimming, sunbathing, water sports, picnics, beach games, and more. Read on to learn all about the best beaches in Austin. Definitely one of the better-known beaches in the Austin area, Emma Long Park was once known as City Park and has long been a popular spot for Austin locals to gather and enjoy recreational and relaxing activities at weekends or special occasions. Emma Long Park Beach sits snugly on the banks of Lake Austin and offers some breathtaking views of the local surroundings, as well as being equipped with some useful amenities and facilities like large parking lots and a long pier. Lots of boat traffic flows along this area, so it can be highly enjoyable to simply sit or stroll along the sand and watch the world go by. You'll need to pay to access this Austin beach, but we think it's worth the price of admission and you will too when you see the magical views and excellent facilities all around the area. This is a very family-friendly beach, with lots of picnic areas and a safe, roped-off swimming zone right out in the waters of Lake Austin. You won't find any lifeguards here, so parents will need to keep an eye on kids at all times, but the park is very safe and fun for people of all ages. You'll even find a volleyball court and a separate volleyball net set-up in the swimming area for games with friends. Be warned, however: this beach is sometimes reserved for private parties and special occasions, so it's important to get in touch before arrival to ensure that the beach is open. Located just off Grove Boulevard, Secret Beach is aptly named as many people, even long-time Austin residents, don't even know about the existence of this little hidden gem. It's actually quite hard to find, which explains why so few people have heard of it, but once you do find it for the first time, you'll definitely want to come back again and again in the future. Secret Beach is a lovely spot to come with the kids, with a nice sloping bank of sand and shallow waters. Swimming is prohibited here but you can at least dip your feet in at the edge. Shelling is popular here and old-time beach activities like picnics and making sandcastles can be enjoyed at Secret Beach too. This is also a good spot to bring your furry friend, with no rules against dogs on this Austin beach. If you don't mind driving a short way outside of Austin, Lake Pflugerville Beach is undoubtedly worth the detour. Situated out in Pflugerville, this large lake is perfect for all kinds of recreational activities from kayaking and canoeing to windsurfing and fishing. There are three miles of hiking trails to be enjoyed, a play area for the kids, boat launching facilities, picnic areas, and a long stretch of sand for fun and games. The sand here is composed of lots of tiny rocks, so it can feel a little rougher than the sort of sand you might find at other Austin beaches, but this minor setback is vastly outweighed by the huge list of advantages at Lake Pflugerville Beach. If you're looking for an Austin beach that's off the beaten track, head on over to McKinney Falls State Park. Some gorgeous scenery can be found all around this park and there are lots of stunning scenic trails to follow and natural sights to be seen. 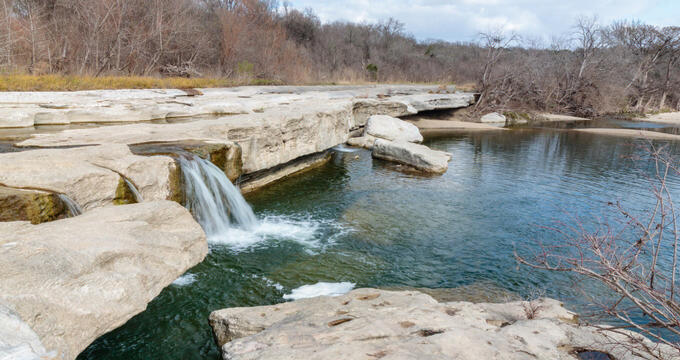 Multiple beaches can be found in McKinney Falls State Park, mostly made up of soft, smooth pebbles that are just right for skimming across the waters of the falls. All visitors aged 12 and above will need to pay an entrance fee, but you can have a full day of fun here and really get a lot of value for your cash.